2. Cut pears in half core and then slice ¼” lengthwise and rub with lemon juice. 3. Take micro or baby greens and toss with ½ of the dressing. 4. Place in middle of dinner size plate. 5. 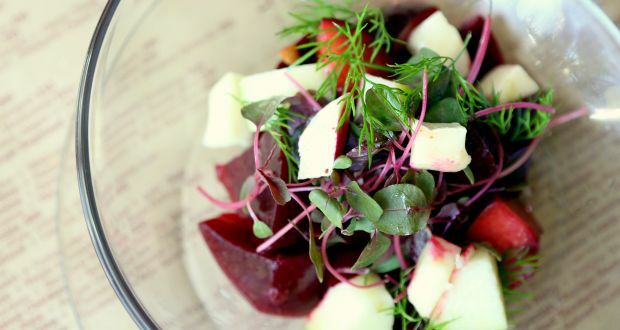 Arrange beets and pears and drizzle with rest of dressing or to your taste. 6. Sprinkle with goat cheese or apricot stilton and pecans and serve with a great crusty bread. Randy Fuhrman Events has "A Taste for Entertaining". With over 45 years of experience, we are recognized by the special events industry for our talent, experience, and passion for catering and event production. Randy Fuhrman Events has won numerous industry awards including three for Outstanding Event presented by Special Events Magazine, and the Beverly Hills Chamber Golden Palm Award for Innovation in Small Business. We proudly earn repeat business from our extensive list of prominent clients by designing signature event experiences. From the most intimate dinner for two, to a full blown event for thousands, Randy Fuhrman Events handles your event from finding the location to creating a branded gift. Whether in state, out of state or international, we want your experience to be incredible as our team will take the worry away from all the details and let you be an honored guest at your own gathering. Copyright © 2018 Randy Fuhrman Events. All rights Reserved.